You are looking at a picture of a chocolate candy Blues Clue thinking chair with your choice of the 4 different characters. 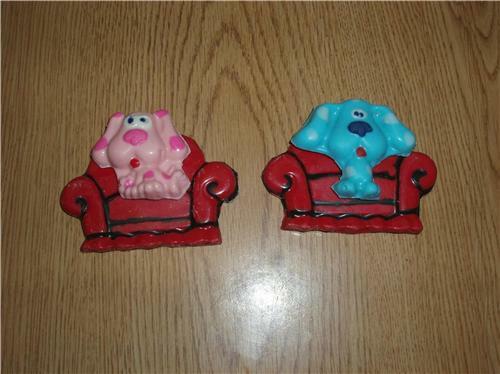 You may choose Blue, Sprinkles, Periwinkle, or Magenta on the chair. You will receive one chair with the character of your choice on it. These are made from chocolate and all handpainted. This candy is made fresh to order and comes in bag tied with a pretty colored ribbon. These would be very cute for your childs birthday party.